Helping members to see mission and missionary as good words and see themselves on mission 24/7/365. So excited. Right church, right people, right time. Slide 2 – Where are you now? Ok. The reason that I asked you to reflect on those questions was for you to get a gut check, to see how you are feeling about life right now. You see, so many people wander through life, feeling that they don’t matter and that small impact that they themselves can have would make no difference at all in the world. And you know what? They’re wrong! They do matter and you matter and you can make a difference in this world. Today. Right now. And what we’re here to talk about today is how to get started. And the best news is that nothing in the big scheme of your life has to change for you to begin. You don’t need to lose 10 pounds, get a new wife, move, or even contemplate doing any of those things. You just need to change your mind. But to do that, you need perspective and a way forward. I hope to give that to you today. Slide 3 – So what’s this all about? All of what you’ll hear today is based on my father’s life’s work and my involvement in it for the past seven years. You see, in 2000 my father wrote a book, and dutiful daughter that I am, never read it until 2003. When I did I was blown away. I told him, “You’ve got to put this all in a workbook so people have an easy way to get started.” Since then, I’ve assisted in or run four conferences based on this material and my dad’s done many more. We’ve learned a lot during that time and have tried to capture it in the workbook that’s about to be published. So, I’ve learned a lot through this whole process and really, there’s only one thing that I know for sure with 100% certainty. This is what God wants. I went to a conference five years ago that really turned my head around. I was stunned as person after person delivered the same message about the importance of mission in every day lives with different words, different media – but one voice. And I finally figured out that must be God’s voice. And that this must be what he wants for us. So before we go on, I just need to cover these key theological points because they underpin everything else I’ll say today. Next, we need to look at a couple of key words and how we understand them. Slide 5 – Mission and Missionary? Is this what you think of when you hear the word mission or missionary? Someone serving in far-flung areas, giving up everything in God’s service. Yes, there are amazingly wonderful people doing just that but they are not the only people on mission for God in the world today. 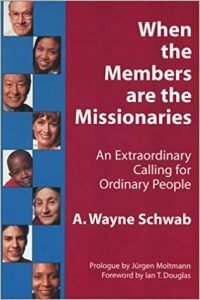 I’d like you to consider opening up the definitions you have for mission and missionary and expand them because it will change how you look at God’s work in the world, how it’s done, and who does it. This is an important litmus test. Lots of people have claimed to be working for God when they do what many of us consider evil things – like suicide bombers. The Bible says, “God causes rain to fall on the just as well as on the unjust (Matthew 5:45). He loves us all and so His missionaries must love him and their fellow-man as well. Look at this definition. Please see that some people doing God’s work and having a profound impact were or are not Christians. Think of Mahatma Ghandi, the Dalia Lama. Great thinkers, leaders, and people. And they were absolutely missionaries when we think of the term in the broader sense. As you take both of these definitions together, it’s clear to see that just about anybody of any age and any status in life can be a missionary. And that’s true. Mission can be halfway around the world like in the last picture or it can be in the next room. Missionaries can be like Mother Teresa or they can be like your neighbor or better yet, YOU. Slide 7 – So why should I be a missionary? I just want to highlight two things. First, you’ll be stretched as you work for God. You’ll be asked to give perhaps physically, spiritually, financially, develop unrecognized gifts, sometimes you’ll feel like you’re flying without a parachute. And it will be the most rewarding, fulfilling work of your life. God multiplies your efforts. It’s unreal! You start off thinking you’re going to do one thing and before you know it everything snowballs. Five years ago, I committed to hosting a neighborhood ladies’ get-together. A year went by and I was feeling guilty for not having done what I said I would do so I just put it on the calendar to be done with it. Twenty-two women showed up and one had tears in her eyes saying how grateful she was to have been invited. Another sent me an email the next day saying that she’d told her husband she no longer wanted to move. And I saw it. This was my mission. I started a monthly Bunko group, out of that developed our neighborhood watch, out of that came a neighborhood wide email list so we could keep each other updated, we have an approved babysitter list. We’ve found lost dogs, returned stolen property, caught vandals in the act – all of this because I did one thing. God blessed it and all of us in the neighborhood. BTW- most of my closest friends and my children’s friends I met through my neighborhood involvement. God has blessed me and my family richly for taking on that mission. That mission has been real work but it’s been beyond rewarding. I also want you to know that this is the only stuff that really matters in life. We can get so focused, can’t we, on whether dinner’s done, the oil in the car got changed, or that key meeting we have at work tomorrow. And all of that “stuff” will be forgotten in a week because there will be a new “crisis of the moment”. But if you have a brother that is going off the rails and you don’t reach out to him when you know you should because you have to make dinner, get the oil changed and, prepare for that meeting – that’s the kind of stuff that will wake you up in the middle of the night in five years. And no excuse you can make to yourself will ever be any good. Attend to what God puts in front of you first and ask Him to help you get the rest of the garbage out-of-the-way. In order to be able to figure out what we should be doing as a mission we need a way to look at our lives; a way to look at each aspect so we can give God the opportunity to call us as He needs to. So, this is a way you can do that. We all operate every day in these six interlocking spheres: home, work, local community, wider world, time off, and church. We all have a home life, work life, etc. Each one of these represents a part of our lives that’s distinct from the others. So, each area that we operate in every day offers us opportunities for mission. We’ll talk about that next. Slide 9 – So how do I figure out what my missions are? Now, how you figure out just what your missions are is really important. There are many ways to do it, but I’m going to show you the one that I use and know could work for you too. You take each of those six areas that we just talked about: your home life, your work life, your life in your local community, etc. one at a time and basically do a work sheet on each one to discern your mission in that area. The worksheets are all the same and consist of four parts. First, you pray for God to give you a vision for what He would like you to do; an idea of how life should be in that area. For example, you may sense that God wants you to help fix the toxic work environment at your job. After you get a feel for where God wants to take you, you then begin forming a plan to achieve that vision that involves concrete steps and a commitment to take them. That’s the real power of this. You’ll turn discernment into action. You’ll also figure out who you need to help you and think about what you might say to get that person or people to help you. Now, once you’ve completed all six worksheets, you’ll have a pretty clear idea of where you’re headed in life. So, clear as mud? Let me clarify. I have just a few things to share with you about the discernment process. Some of the missions you’ll sense that you are being called to will be ones that you’re currently already working on. So, if you’re having struggles with your teenage son, this process will confirm that, and will have you commit to an action that will improve it, and will allow you to be a lot more intentional about what you’re already doing. That is so important. You’ll get far better results as you intentionally take one and then another, slowly and deliberately dealing with the situation, praying and discerning each step as you go. Missions vary in their relative importance and how long they take to finish. So out of those six areas of your life, you’ll probably have just one or two really important missions and the rest you can kind of back burner. Some missions are as simple as a phone call or two to someone you feel prodded to call and others are more complicated and may involve many steps, like the neighborhood I told you about. You’ll find that you’ll generally have a partner with any mission you undertake. So, if you’re working with your teenage son, you’ll probably be talking to his other parent to figure things out. The worksheets will guide you to identify whose help you might need and think through what you might say to them. This can be really helpful because sometimes you won’t know if your partner is a Christian so it helps to think in advance about how you might draw them into working with you. As a final note, try not to second guess God’s choice of partner for you, especially if you’re dealing with a good person who might be a self-proclaimed, perhaps, agnostic. You never know what God’s trying to do in their lives through you. Once it’s clear who your partner is just say, “Thank You God” and get started. Slide 13 – P.S. It’s gonna be raining. Life is like driving in the rain at night. There’s so much rain coming at you and the distraction of the wipers makes it almost impossible to see the markers ahead. If you’re waiting for the right time to start being on mission. You’ll never start. Because the rain, like a mortgage that needs to be paid, or kids that need to be ferried here and there, that rain is never going to start. So you gotta drive through it and keep your eyes on those hard to see mile-markers. Those are you missions and, if you focus on those and not the rain, you’ll get where you need to go. Whatever mission you’re working on is really part of God’s mission. Therefore, He cares more about it than you do. He wants you to succeed. So, ask for help. Ask Him to clear those everyday, time-consuming events from your calendar so you can do what He wants you to do. He will help you focus on those mile-markers and not the rain. And I’ve got a tool that will help you as well. This is a great tool if you tend to feel overwhelmed by your daily responsibilities (that would be me) and find it hard to stay on track with what you feel called to do. This sheet is called a road map and it lists only the key pieces of information you would need to stay on top of your missions. You’ve got the six areas of your life listed in the column on the left. Then the vision or goal that you defined for yourself when you filled out your worksheets is the first column, then your partners, and what you’ve discerned that you should be doing make up the other two columns. You can tape this to your mirror, tuck it in a book and update it as you complete steps in your mission. It’s a valuable tool that works. These are portions of road maps from actual people to show you how this can look in real life. Pray for blessing and a PARTNER who may have the gifts you need. Once you understand yourself, your personality, gifts, etc., try not to get too hung up on it. Take a look at this. This is my true personality. Do you think I’ve been able to use any of that lately? Not for the last five years. If I looked through the lens of what I know about my personality, I would have rejected nearly every mission that God put my way these last few years. So try not to worry too much if you haven’t got the gifts to do the mission you feel called to do. God will develop gifts you didn’t know you had or bring you a partner with those gifts. I’ve seen it happen so often and it’s happened to me. Slide 19 – Time’s up. So, my time’s up for today. And so is yours on your old life. You can start a brand new life filled with all of the purpose and excitement that you can stand and you can start on it today. You can do great work, draw closer to God, and know for sure that you matter and the next time someone asks you tough questions like I did at the beginning of this, you won’t have to say anything at all. Your smile will tell people everything they need to know.